With A/W 16 shows now done and dusted, we allowed MatchesFashion.com's buying director, Natalie Kingham, all of, oh, about 24 hours to give us her top-line digest on what's going to be hot next season—and therefore, precisely what you need to know now. We've pinpointed some of the styling trends you can get onboard with already, but if anyone knows what's going to be a retail smash in stores, it's her. From listing the Vetements floral dresses that had waiting lists as long as the brand's hoodie sleeves to the fresh new labels you've not heard of but will instantly want to buy (check out these Sanayi 313 slippers), she is our trusted bellwether of the shopping world. Scroll down to see what piqued Natalie's interest at Paris Fashion Week—then shop for the pieces that can reflect the new mood already! #1: The new Balenciaga is going to be HUGE. What did we tell you about this collection? From the shrugged off jackets (this is already happening on the streets in response) to the giant shoppers and messed-up florals, this new look is going to influence a lot of fashion people from now on. We'd also like a pair of the crystal-embellished shoes, please. #2: Loewe's accessories are going to be very popular. 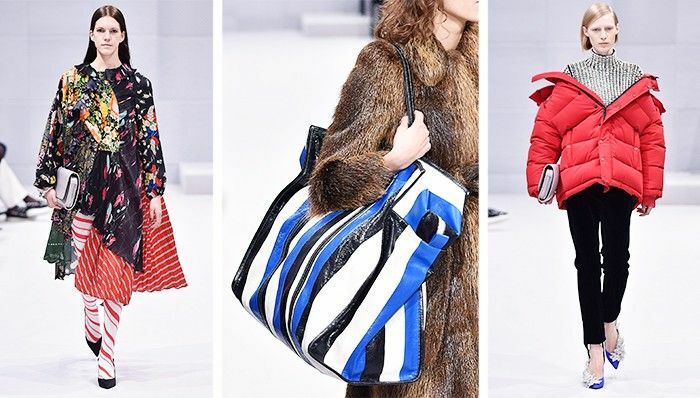 We all know Loewe creative director J.W.Anderson is a master of the accessories world already: His Puzzle bag is a firm favourite amongst the FROW, but it's not just bags this designer can magic up. The bauble earrings and zippy neck collars from his eponymous line are also a top choice for adventurous accessorising pros. #3: The statement poncho could replace your coat. A wardrobe that looks well-travelled and full to the brim with interesting buys from across the globe is the cool girl's way to look ahead-of-the-curve. This luxurious version of a knitted poncho from Chloé's A/W 16 show provides that concept by the bucket-load. #4: Stocking up on velvet is a wise idea. We knew Alexa Chung was onto something! The style icon has recently showcased a wardrobe almost exclusively comprised of velvet. There are plenty of pieces you can shop now to get the look early—seek out jewel tones for extra impact.